I hope you are all doing well? Welcome to #blogmas day 10! I thought today I would bring you something that I have been completely obsessed with lately! I am pretty sure everyone and their dog knows about Makeup Revolution and all of their makeup offerings. Around a month ago I decided to pop into a local Superdrug of mine to take a peek at the entire range after being introduced to them during the summer. 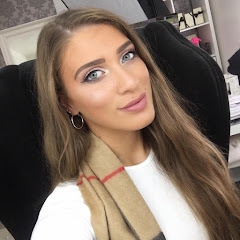 I must admit at first I was a little confused with the whole Makeup Revolution and I Heart Makeup thing, however, I soon discovered that they were in fact sister brands and good golly they had some fabulous products. This will be my first ever post on the brands so I decided to start with something fun and show you their gorgeous Blushing Hearts. Firstly, how beautiful are these Blushing Hearts?! From the packaging and the product themselves they are just so spectacular and for £4.99 they are a total steal. I am not ashamed to admit that I will love having these on display on my new vanity...I mean just look at them! The packaging itself is a strong cardboard, however, it is considerably stirdy and I have full faith that the blushers will be protected (hope I haven't jinxed myself now haha). The Blushing Hearts collection consisted of six different triple baked shades. 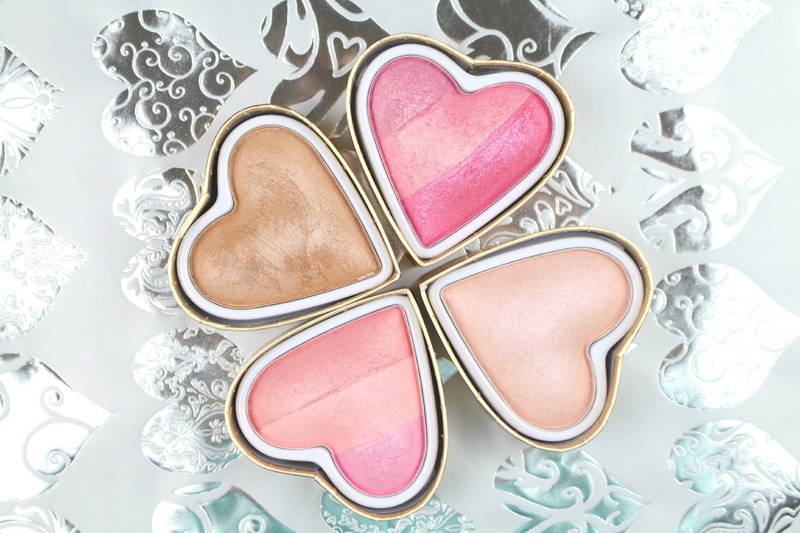 I picked up four; Candy Queen of Hearts, Summer of Love Bronzer, Blushing Heart and the Goddess of Love Highlighter. Additionally, there are two other shades; Love Hot Summer Bronzer and Peachy Keen. As you can see from the swatches, each shade is absolutely gorgeous and leaves a lovely healthy flush to the skin - a total hybrid product! Some of you might be looking at these and thinking "gosh these look familiar?!" and you are 100% correct. 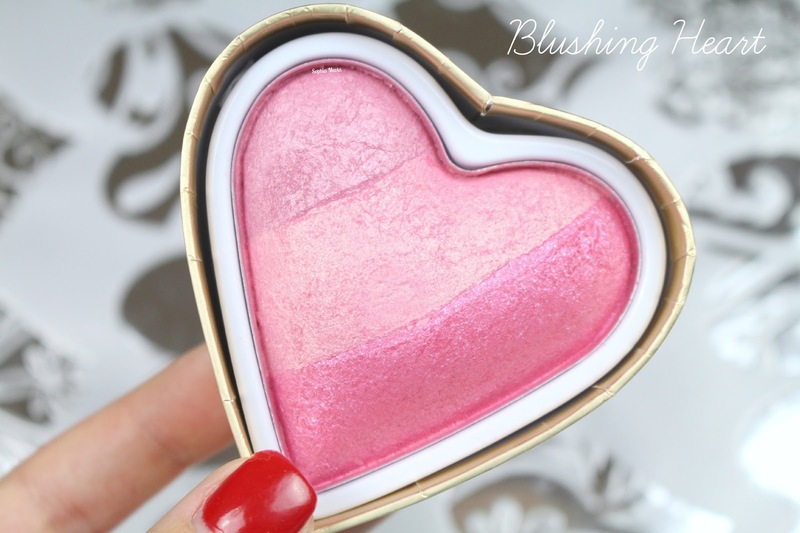 These Blushing Hearts are almost identical and are amazing dupes for the Too Faced Sweetheart Blushes - minus the price of course (£24). I actually own all three of the Too Faced Sweetheart Blushes and can honestly say that they are pretty spot on when it comes to formula and shades. If you would like to see a full comparison then please let me know. 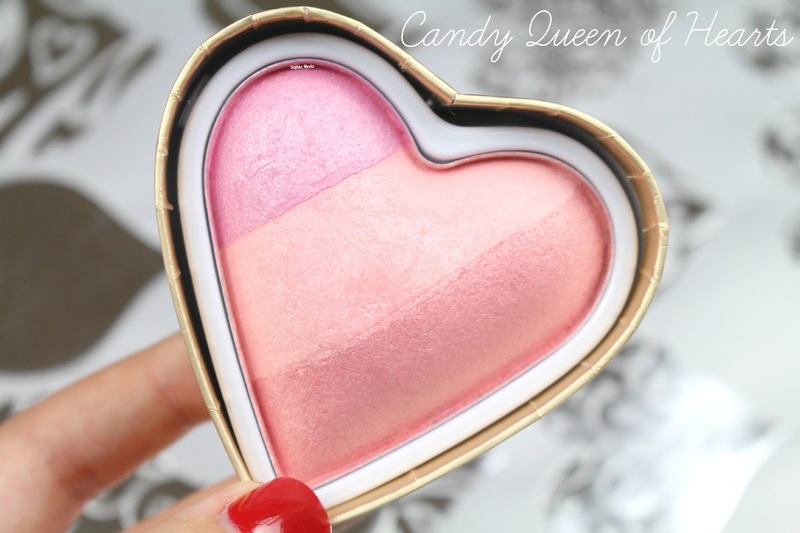 Candy Queen of Hearts is one of the three available blush shades from the collection and is definitely one of my favourites. Each shade individually is beautiful, however, when swirled together they create this gorgeous bubble gum shade that much resembles MAC's Dainty blush. Even though these are marketed as blushers, I would definitely use a few of the shades as highlighters alone or even eyeshadow - I'm looking at you middle shade! 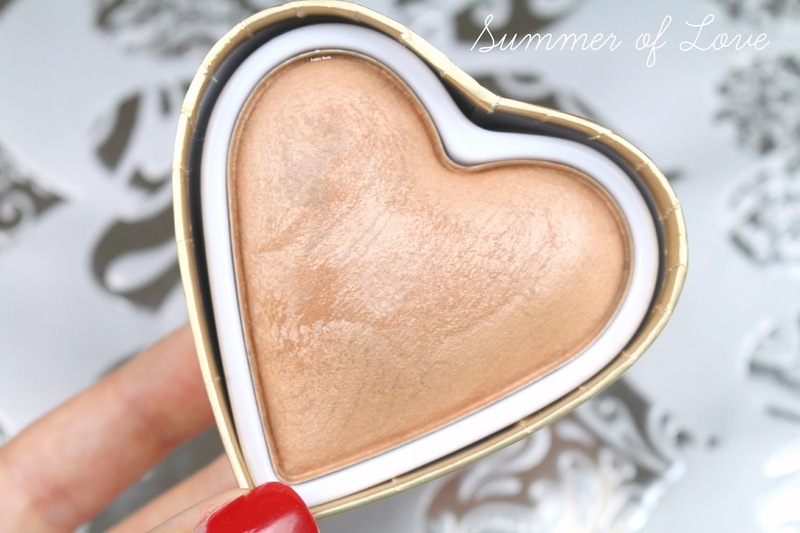 Summer of Love is one of the two bronzers available from the collection and is definitely the lighter of the two. For me, this is the perfect everyday bronzing shade that helps enhance my complexion to give me that summer glow I long for all year round haha. 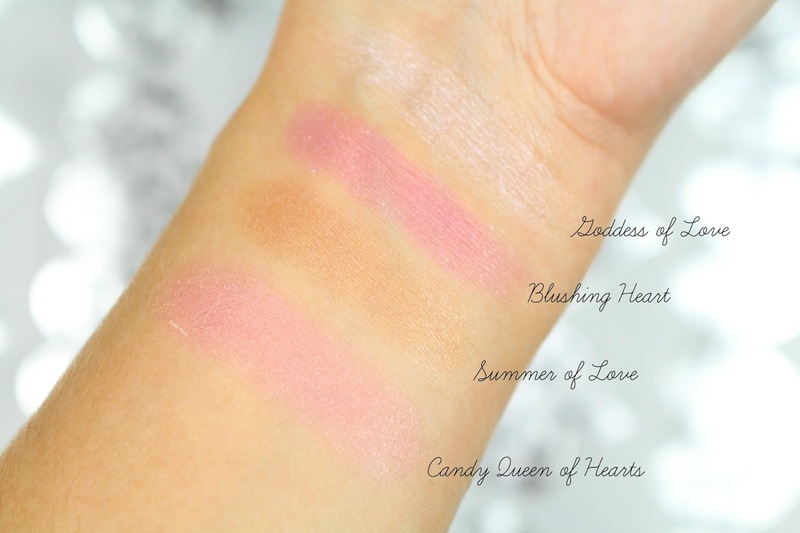 Blushing Heart is similar to Candy Queen of Hearts except it has slight purple pink hues and is slightly darker. You can go in and use each shade separately if you wish, however, I much prefer swirling them together to create this gorgeous pink shade. Goddess of Love is the only highlighter in the collection and is absolutely stunning. I am not sure if the above swatch does it justice but in real life it is a gorgeous light champagne highlight and could possibly be a dupe for MAC's Soft & Gentle. 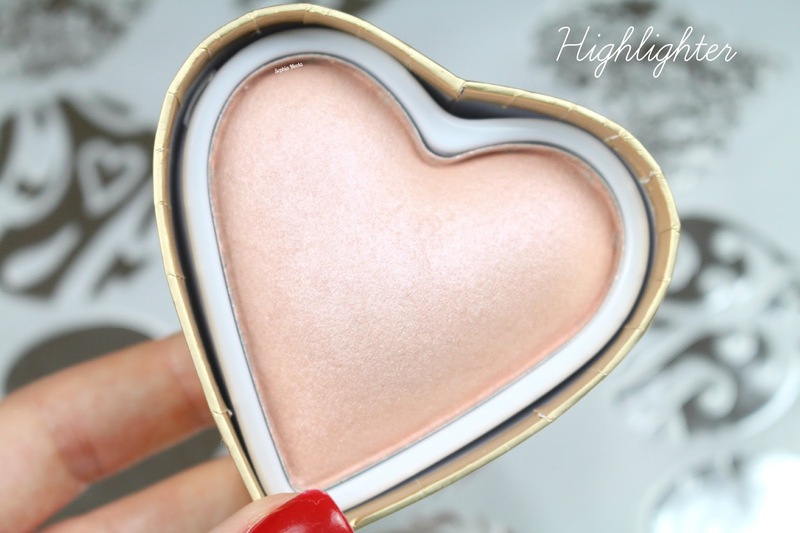 Overall, I am completely impressed with these Blushing Hearts and I cannot wait to collect the rest of the line and explore Makeup Revolution and I Heart Makeup more. For £4.99 you cannot go wrong - these would make lovely stocking fillers around Christmas but also a lovely treat for yourself if you are looking to expand your makeup collection or if you are just getting into makeup. If you would like to check out the Blushing Hearts or anything else from the two lines you can do so in-store or online at Superdrug or Makeup Revolution. Like always lovelies, if you have any questions, requests or if you just want a chat you can contact me on my social media or leave me a comment below. I love hearing from you all and I make sure to read every single comment…they really make my day! The wife has some of these and I was surprised to find how cheap they were in comparison to BeneFit for example which I know she purchases at a huge price (In my opinion). Summer of love looks divine, gorgeous colours. I would love to see a comparison post, please! I've been listimg after these but haven't been sure if the shades are right for me! These are so cute! I want them all!